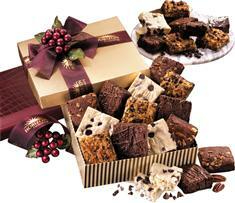 You'll make everyone in the office smile with this delicious gift! One-dozen, “fudge-like” home-style brownies! Our luscious, gourmet assortment includes (3 each) Double Chocolate, White Chocolate Raspberry, Chocolate Pecan, and Chocolate Butterscotch Coconut brownies. These delicious treats are carefully nestled into a gold-striped gift box and tied with a sheer burgundy ribbon, foil-stamped with your logo. A great year round gift!